The functionality of publishing content to Twitter is provided through an Enterprise Server plug-in. The plug-in provides a Publish Form template with which a Tweet with an optional hyperlink can be posted. This article describes how to integrate Twitter in Enterprise to make it possible to publish from Enterprise to Twitter. Communication between Twitter and Enterprise is done through a Twitter app. Step 1. Log in to https://apps.twitter.com using the Twitter account to which you want to post messages. Step 3. Click Create New App. The 'Create an application' page appears. Step 3a. Enter the name, description, Website and callback URL1. Step 3b. Agree to the Developer Agreement by selecting Yes, I agree. Step 3c. Click Create your Twitter application. Step 3d. Click Create my access token. Step 3. Click on the application that you want to use for publishing content to. The Details page for your app appears. The Twitter Server plug-in allows Enterprise Server to communicate with Twitter and provides the Publish Form template that is used for creating the Publish Form with which the Tweet is created. Step 1. 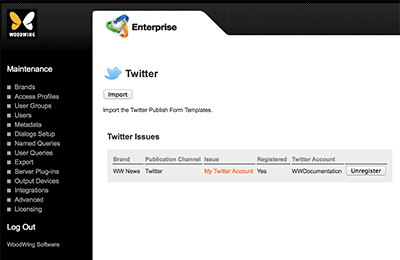 Download the Enterprise Server plug-in named Enterprise Twitter Integration from the software download page. A folder named "Twitter" is created. Step 5. Make sure that the plug-in named Twitter Publishing Connector is enabled (as indicated by the green icon in front of the name). If needed, resolve any conflicts. In Enterprise, publishing content to Twitter is done through a Publication Channel. Step 1d. From the Publish System	list, choose Twitter Publishing Connector. Step 3. Create an Issue by clicking the Add Issue button and entering at least a name for the Issue. Step 4. In the Twitter Account section, enter the Consumer Key and Consumer Secret. Note: To obtain the Consumer Key and Consumer Secret, access the Keys and Access Tokens tab for your app on https://apps.twitter.com. This step will register the Issue in Enterprise Server with the Twitter app. Step 1. Log in to Twitter with a Web browser, using the account for the created app. Step 2. Access the Twitter Maintenance page in Enterprise Server. Step 2b. Click Twitter. The Twitter Maintenance page appears, showing all available Twitter channels. Step 3. For the Issue that needs to be connected to its defined Twitter app, click Register. The Twitter page appears, asking to authorize the app. When the process is successful, the Twitter Maintenance page in Enterprise will appear showing that the Issue is now registered with Twitter. Publishing to Twitter is done by entering the content in a Publish Form. This Publish Form is based on a Publish Form template which is defined in the Twitter Server plug-in. Importing the data from the Server plug-in creates the Publish Form template in Enterprise Server. Step 1b. Click Twitter. The Twitter Maintenance page appears. Figure: The Twitter Maintenance page. The Publish Form is imported and the result of the import action is displayed. Step 3. Only select the Publish To Twitter test.